QSLs will go via OH2BH. It is surprisingly cold in Kosovo as temperatures are running record low for this week today it was minus 13 C (8F). The group is in good spirits and keeping Z60A activated as much as they can with their other duties. Another challenging issue is a noise that arise at dark when hundreds of lights come on increasing in number are those noisy LED lights now penetrating the market. Nothing we can do about those other than suffering with up to S8 noise. More bands will be added for the weekend and among them 160M and 17M. The team will be enhanced by K9JF, PB2T, VE7NY, IK0FVC, G3TXF and DL3DXX and others so the firepower will be added after the weekends Independence ceremonies, added to the DXCC happiness. A new team of G3TXF, IK0FVC, K9JF, VE7NY, DL3DXX, DL5CW and DJ5IW will be at work soon with three radios again as they lost one that had to be replaced. In total, hams from 10 countries will participate in the project’s current phase. Last Sunday marked a wonderful and memorable reception honoring the recent DXCC status of the Republic of Kosovo. Speeches were made by the SHARK president Vjollca, Z61VB, Kosovo’s regulator (ARKEP) Chairman, Kreshnik Gashi as well as ARRL Honorary VP Jim, K9JF and IARU’s R1 Secretary Hans, PB2T. Their remarks were complemented by words from Project Goodwill’s Kosovo coordinator, Martti, OH2BH. All were emotionally touched by this long march of 10-years, further enhancing the original U.S State Department recognition in February, 2008, while now saluting Kosovo’s official entry into the DXCC world on an equal basis. On the radio front, the 40.000 QSO mark has been passed as the team is concentrating on maximizing its Asia and North America numbers. They are well on their way by penetrating those selective openings. Be patient, as their best effort is given at all times in spite of the high noise level. As the locations are fixed, the only improvement opportunity is to see whether low-laid receiving antennas would help with this mission. The second week team will try to accomplish that task as they move toward the upcoming weekend. Many are asking about an immediate LoTW upload during the operation, and these options are being taken under consideration. An LoTW upload and early QSL card may be considered as an additional service, while its modest compensation would be exclusively directed to further support for evolving Amateur Radio in Kosovo. The project members are thankful for the local Z6-team and the OH, OZ and S5 guys, who did a great job in building up the sites and handing out the many new counter contacts. Happy DXCC week was passed with best of amateur radio. 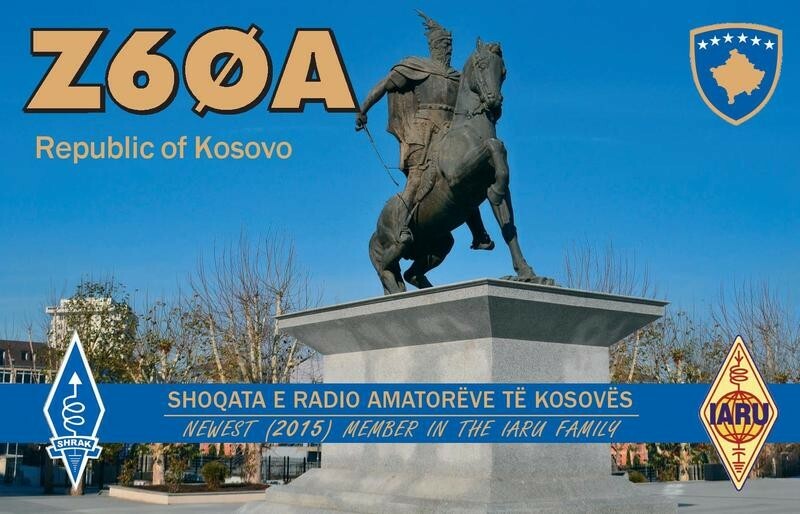 The first Z60A activation will culminate with the actual day of Kosovo’s 10th Independence anniversary, Sunday Feb.18, 2018, with extended festivities, which will include the international amateur radio delegation. On same weekend the ARRL DX Contest (CW) is running, and the visitors will team up with the locals to wrap up the project and salute the ARRL and U.S contesting community with Z6 now being accepted for all ARRL awards and contest programs. As the Kosovar amateurs have suffered for the past ten-years with limited opportunities and sometimes with the pirate label, it is now noted that with the new DXCC status, DXers the world over have taken a positive step forward to close the 10-year gap and welcome the Kosovar hams with open arms to our great community. Kosovar hams are much taken by this gesture, and the project group has organized to move forward on turning potential help to the best of Amateur Radio in the Republic of Kosovo. The weekend of February 10/11 will be a showcase of locals as they will now take the microphone and put the Z60A on the air accordingly: Z61DX, Z61VB, Z63DBB and Z62FB will be at the controls for a 20M showing, both CW and SSB. Kan Mizoguchi, JA1BK has stepped forward first and shipped a brand new Yaesu FT450 to Dona, Z63DBB (YL) so that she will be able to carry-on with her home-based activity. With Z61DX and Z62FB suffering with the Pristina high noise level, RemoteRig (SM2OAN) has donated two pairs of the remote control units so that a clean receiving site can be established outside of the capital Pristina. The European DX Foundation (EUDXF) has stepped forward, and their monetary support was presented to SHRAK, the Kosovo IARU member society. The Yasme Foundation has released an extensive series of ARRL publications to the SHRAK HQ library at the Technical University of Pristina. The ClubLog OQRS system is set to cover the cost of direct QSL postage – USD 3.00, while also allowing voluntarily, private contributions. All donations small or large are most welcome to support SHRAK, the Kosovo Amateur Radio Association to aid in recruiting additional Kosovar youth and to activate the existing Amateur Radio operators and support their activities. As many have requested confirmations during the ongoing activation, it has been decided to do an immediate LoTW and fast direct QSL service for those who contribute USD 20.00 or more. This option would not delay any of the traditional QSL options, but just put a priority on those who are willing to help Kosovo Amateur Radio finally move beyond the past ten difficult years. The complete Z60A log will be uploaded approximately four weeks after the current activation. The current activation will end immediately following Kosovo's 10th independence anniversary celebrations on Sunday, February, 18 2018. The additional four-week window will allow for corrections and checking for potentially busted calls. The 3rd week is starting and many delegates in Kosovo will be heading back home. This week has offered variety of low-bands and odd bands on CW by VE7NY and DL3DXX who will depart soon. Now the new week will concentrate on giving out some RTTY QSOs. The group of DJ5IW, DM5TI, DD2ML and S57AW will keep the RTTY fire on, including the CQ WPX RTTY contest while the next weekend would bring-in the local showcase by the most active locals; Z61DX, Z61VB, Z62FB and Z63DBB. They will be a fresh air from the Pristina HQ Station at the Pristina Technical University. The 4th and last week will bring back a small international tag- team, adding the number of country delegates to eleven (11). They will take the party machine to the actual 10TH Independency Anniversary on Feb.18, which activity would include sporadic showing in the ARRL DX (CW) Contest. The weather has been warming up in Kosovo lately and is currently above the freezing mark. Many are wondering why it isn’t possible to eliminate the noise by setting up camp in the quiet open field. The underlying fact is that Pristina is more that 650m above the sea level, and this winter has been particularly cold with -13C temperatures experienced during the activation period. There are prospects in place for the final and upcoming week to operate from a better place. Driton, Z61DX, has been testing the location and reception is dramatically better than at Z60A. Considering that Kosovo will stay on the DXCC map and that this is the very first activation, not all noise and other challenges are expected to be resolved. However, a remote location for RX/TX is underway and the first tests may be done this week. Bill, AA7XT, has donated an XR9 antenna to this application and it is now used at a temporary location by Z61DX - soon to be moved to the remote site. The project seeks a reasonably priced pair of second-hand TS590 rigs for remote implementation. Please contact N7NG or OH2BH. The purpose of this first activation was to bring in delegates from as many countries as possible. This helps Kosovar hams in expanding their network of friends into many interesting countries – something that had not happened over the past years of “none” status. During this coming week Toivo, ES2RR, will boost the number of delegate countries to ten (10). The departing German/Slovenian team of DJ5IW, DM5TI, DD2ML and S57AW did a fantastic job while introducing the data modes (RTTY & FT8). They made up to 10,000 digital QSOs (some 4000 in the WPX RTTY), with the Z60A project total now reaching 70,000. Driton, Z61DX, and his brother Agim, Z61AS, were also QRV all day Saturday on FT8 as a result of the past week’s work by Ulli, DD2ML, and others. The DX community has been generous to their fellow hams in Kosovo. All donations are temporarily marked for SHRAK needs and will be managed by the Yasme Foundation directors Martti, OH2BH, and Hans, PB2T, together with Pertti, OG2M, and SHRAK president Vjollca, Z61VB. The “early LoTW with fast paper QSL” concept will continue to March 15th, 2018. Thanks also to Jyri, OH2KM, for managing all related data operations. The final jubilee week is now starting. An international delegation will participate in the ceremonies celebrating the 10th anniversary of Independence. In addition, they will give out new DXCC contacts to those who still have an “ATNO” need and be active in the ARRL DX CW contest. The team includes Z61DX, ES2RR, OG2M, OH1MA, OH2BH and others. Z60A News 19 February 2018. ES2RR, OG2M, OH1MA, OH2BH and Z62FB left Pristina and crossed the Albanian border at 2PM today on their way to their Albanian homes. They plan to work on antennas at ZA1EM and ZA1F tomorrow before finally heading to their respective countries on Wednesday. They left a piece of their hearts, and left their Kosovo operating sites in intact for their return over the weekend of the ARRL DX (SSB) Contest in two weeks. The first Kosovo activation resulted in 81,478 QSOs with 26,487 individual callsigns. Of the total number of QSOs, some 22% (17,876) were from North America and 10% (8255) were with DXers in Asia. Europe was obviously dominating with 66% (53,725) QSOs. Delegates from ten (10) different countries were part of the initial activity. They returned home with many fond memories of this now 10 year old Republic, which was finally granted DXCC status on January 21, 2018. The festivities surrounding Kosovo’s 10th anniversary were warm and memorable. The entire country - particularly the capital Pristina - were the party grounds, with the main street full of people listening to the open-air street concerts, featuring the famous British singer Rita Ora, a Kosovo native. The evening was cold - below the freezing mark - but the warmth of the occasion overrode the cold February night at 650 meters above sea level. In the comfort of the city center, the Government of Kosovo offered a memorable reception and luncheon marking Amateur Radio’s past ten years toward this memorable day. Martti Laine, OH2BH of Project Goodwill Kosovo and Hans Blondeel-Timmerman, PB2T of the International Amateur Radio Union were personally awarded plaques commemorating their support in making this day happen. Kosovo’s good name is now carved in stone, and many Kosovar voices will continue to penetrate the radio spectrum. A new DXCC counter was born! Please kindly look at your QSOs in Club Log and at QRZ.com (Z60A). In the case of errors, please allow the group look at problems and correct them accordingly. For a next three weeks, errors will be worked out and the log will be entered into Logbook of the World (LoTW). Early donors will receive their direct QSL cards with others to follow immediately thereafter. Thank you for being part of the first (Z60A) Kosovo activation. The Z60A organizers OG2M, OH2BH and OH3JR will be activating this newest DXCC entity again from this Wednesday Feb, 28 onward on low-bands and in the ARRL DX (SSB) Contest, as their previous operating sites are still fully furnished with towers and beams. They were previously disappointed as they were not able to achieve clean receiving on the low bands, thus locals Z61DX, Z61AS and Z62FB have been working hard to find the noise sources. It now looks like both 80M and 40M are relatively clean, while 160M is still a challenge. The operators will try beverages located as far as possible from the noisy electricity lines, and they are also considering going to the middle of nowhere with their Spiderbeam radiator. It will be another Arctic mission though, as the temperatures are estimated to reach minus 17C / 1F, and permanent snow is covering the scene as they are 700m ASL. Additionally they will carry two complete stations for SHARK, to be put on the air by the locals. You can expect even more activity soon. DX Engineering (DXE) has made a sizeable antenna/cable donation to boost the local activity, While David, W9CTJ has donated Yaesu FT450D for one of the local operators to be announced soon.